When Dodge Peterson (Steve Carell) and his wife, Linda (Steve’s real life wife, Nancy Carell) hear over the car radio that the world is going to end in three weeks, the wife bolts from the car and the marriage faster than the speeding asteroid hurtling towards Earth. After the end of the world news is announced, everything changes. Cell phones no longer work, commercial airlines are grounded, and office workers are allowed to wear Friday casual clothing every day of the week. Dodge Peterson is unsure how he should act during the final 21 days of his life. “I don’t know what to do,” he states. His best friend’s wife continues to try and set him up on a date stating that Dodge should not die alone, though it’s pointed out to her that he won’t die alone; he’ll die with everyone else. Then he meets Penny (Kiera Knightly), an English rose who was fifteen minutes late to catch the last plane out before all planes were grounded. Together, Dodge and Penny hit the road. His intention is to catch up with his first love, hers is to try somehow to catch a plane and to see her parents, and you suddenly realize that what you’re now watching is essentially a romantic road movie between the most unlikeliest of couples whose relationship has an apocalyptic deadline. 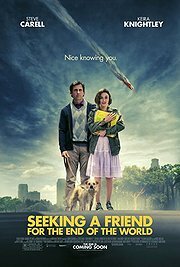 Seeking a Friend for the End of the World is billed and hyped as a comedy, only it’s not, not really, though it’s difficult to say exactly what it is. The rhythm of the film is uneven beginning with scenes of good wit, then moving to drama, to flat out comedy, then to drama again, underlined the whole time by a heavy sense of sadness that never fades. Steve Carell’s Dodge Peterson is a nice though maddeningly benign character. From the moment we first meet him listening to the radio announcer in his car, Dodge appears numb as if not knowing how he should react to the doomsday news. That numbness remains with him throughout the whole film, and even though you wait for that moment when the character might break loose and do something out of the ordinary, he never does. Carell is a funny man, but he’s also a good actor. Because of this he somehow makes us care about his sad sack of a character, even if the character doesn’t appear to care much about himself. “You’re a really nice person,” Penny tells him. “You’re an awful judge of character,” he replies. Kiera Knightly’s Penny is a truly odd match for Dodge in the same way that pairing the youthful, British Knightly in an on screen romance with middle-aged, American Carell is odd. They don’t really go together; in Hollywood parlance, the chemistry isn’t really there. Yet, maybe that’s why in this case it actually seems to work. When the world is coming to an end, the most unusual of relationships might form, as it does here, and you find yourself wanting this fledgling romance to work, even if it only has a few days left in which to blossom. It’s also good to see Knightly show some depth. Since 2002’s Bend It Like Beckham where she appeared to shout almost every line, Knightly has matured into a much better actress, and Seeking a Friend… may be her most rounded performance to date. Because of its subject matter you’re not going to see a happy ending, at least, not in the traditional romantic comedy sense. It’s because of that continual sense of sadness a lot of the more humorous moments are difficult to enjoy in the way the film wants you to, yet Seeking a Friend at the End of the World has a sweetness at its center that should ultimately win you over, even if it’s not quite the movie the advertising offers, plus it has a great soundtrack with one of the best uses of famous sixties pop hits used in a film for some time.